The night before we planned to leave for a wedding, I had a terrible time falling asleep. Before flashy events, I tremble with anxiety about what to wear, and lately what I can make to wear. On this particular night, visions of a crochet necklace danced in my head. It occurred to me that if I could knit with silver wire, I should be able to crochet with it, and why couldn’t I crochet some beads into it at the same time? I realize this is not a unique notion, but I had not seen it executed and I’m not particularly adept at crochet, so the possibilities made me quiver with excitement. 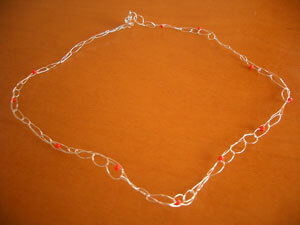 My first attempt was a simple chain with tiny red seed beads. The kink created by the coiled wire manifested itself in a slightly wavy shape in the finished piece. Because of the flexibility, I used 28 ga sterling silver dead soft wire and an I hook. 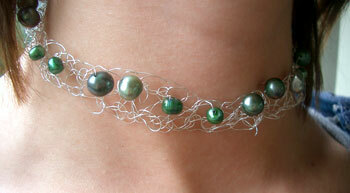 My second attempt was another simple chain with dyed freshwater pearls hooked on every other stitch. 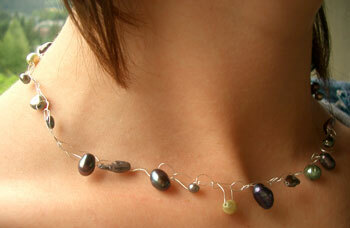 I used 30 pearls for this necklace which sits just on the collarbone. My third attempt started with a plain foundation chain, then a row of single crochet with the beads, followed by a third row of single crochet. While I started with a chain the same length as my second necklace, each successive row shortened the necklace, resulting in a choker. As I said, I’m not very experienced with crochet, so I forgot to take this into account. Each piece was finished with a sterling lobster claw crocheted into place just like another bead. I created a loop on the opposite end and wound the wire around itself to close it up. Thank you to my lovely neck model, Heidi, for her gracious assistance. That middle piece is gorgeous – nice job!! I found you kneek! thanks for your comment on my blog – I got rid of the pesky http:// that was causing the problem! I know what you mean about laying in bed thinking about crafting ideas… And when I have trouble sleeping, I read patterns – goofy, I know – but I like to read directions! beautiful job! if you would like to see some more ideas, stop by my site at http://imageevent.com/patmcaudel there are several pages that show my wire crochet, using sterling and fine silver crochet, and 14kgold fill wire. 26. 28 and 30 gauge are the most common used. i use regular steel hooks size 4 mostly. you can go tiny,or larger alumium g or up of you want wide and lacy. addindg beads as you have startd work really well. i use the afghan stitch mostly i guess, it looks like loomed work, for exact bead placement. They are really nice, the middle ones my favourite. How ethereal! I love the length of the middle one and those are beautiful pearls! But I also really like how intricate the third one looks. Productive insomnia! Beautiful!!! I love the 3rd one the best!!! Lovely! I think the middle one is my favorite. I love the airy quality of it – the pearls seem almost suspended in the air. Very nice. Must be gettin me some wire for this project! Love the pearls best. love them ALL!! do you fear becoming an insomniac? when such great ideas come from lying there in bed?